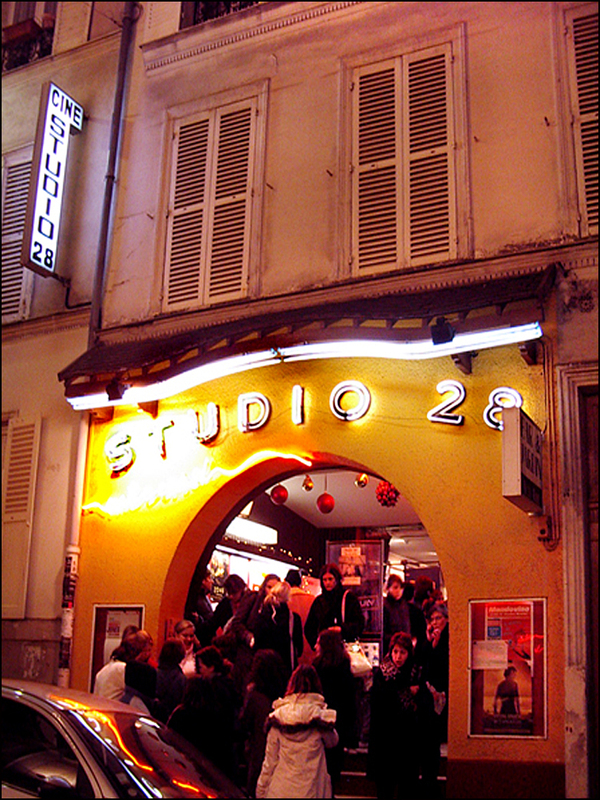 As promised, this week we’re going to shimmy back up to the hill of Montmartre, and pay homage to my favorite movie house in Paris, Cinema Studio 28. Don’t forget to pack your fancy duds, too, because we’ll also trek it back in time again with photographer Maurice Sapiro. Winding it back to the summer of 1956: While playing the trumpet with the 279th Army Band in France, Maurice documented the streets of Paris, deftly improvising with light and architectural texture like a jazz musician. Inspired by the Lumière Autochrome color film process, Maurice’s shots still snap, crackle and pop, much like the City of Light herself. In the words of John Milton, “Come and trip it as you go, on the light fantastic toe!” Step right up. Here’s your ticket! Trekking to Paris? Why not take in a film? After all, cinema is as French as Camembert cheese. In fact, both date back to around the time of the Revolution. Moving pictures got their start in the 1790s when enterprising showman Étienne-Gaspard Robertson began charging admission to weird magic lantern horror shows he called phantasmagoria, projected on the walls of a crypt down under the ruins of the old Capuchin crypt near the Tuileries. Apparently, “the Great Robertson” also invented the zoom, the dolly shot, and the pan. “I am only satisfied if my spectators, shivering and shuddering, raise their hands or cover their eyes out of fear of ghosts and devils dashing towards them; if even the most indiscreet among them run into the arms of a skeleton!” he said. Bonjour, Goosebumps! Now, movies as we know them today came along a century later, when the Lumière brothers patented perforated movie film and invented the cinematograph (which could not only shoot movies but develop and project them as well). In 1895 they held the first public screenings ever, at the Grand Café near the Paris Opéra. Later they invented color photo film too, but that’s whole other reel! Time marches on: Dear fellow news junkies, we have the Pathé Brothers to thank for introducing the news reel to theaters in 1908. They also experimented with hand-colored film. Try watching their footage of Loïe Fuller’s “Serpentine Dance” without grabbing your very own bed sheets and giving it a whirl. I’ve tried but no can do. Lights! Crepe! Action! Here’s the deal: On November 5, 1892, Marie-Louise Fuller (a.k.a. 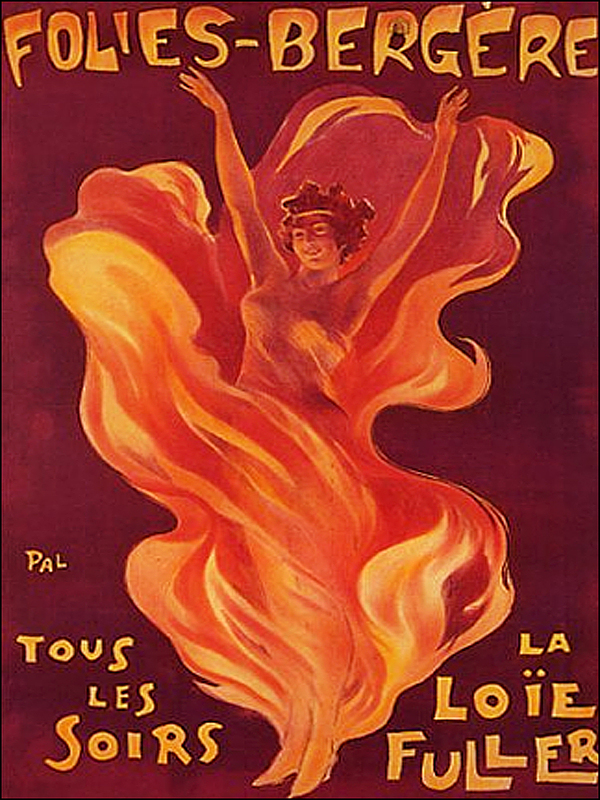 “the Priestess of Fire”) became an overnight sensation at the Folies Bergère after she performed her signature twirls while decked out in billowing Chinese silks, under rotating jewel-colored spotlights projected from above. Looking very much like a life-sized origami in motion, she transformed modern dance in one fell swoop. Like wild fire, word spread. A star was born. Soon the Grand Magasins du Louvre and Bon Marché were selling Loïe-inspired skirts, ties, and scarves. Enraptured by Paris’s “Electric, Salome,” even bars and cafés hopped on the fan wagon, and created flaming cocktails, donning the dancer’s name. Now, let’s trot on over to Studio 28 at 10 Rue Tholozé. With just 170 seats and about ten screenings a week, it has earned a special place in the annals of cinema. 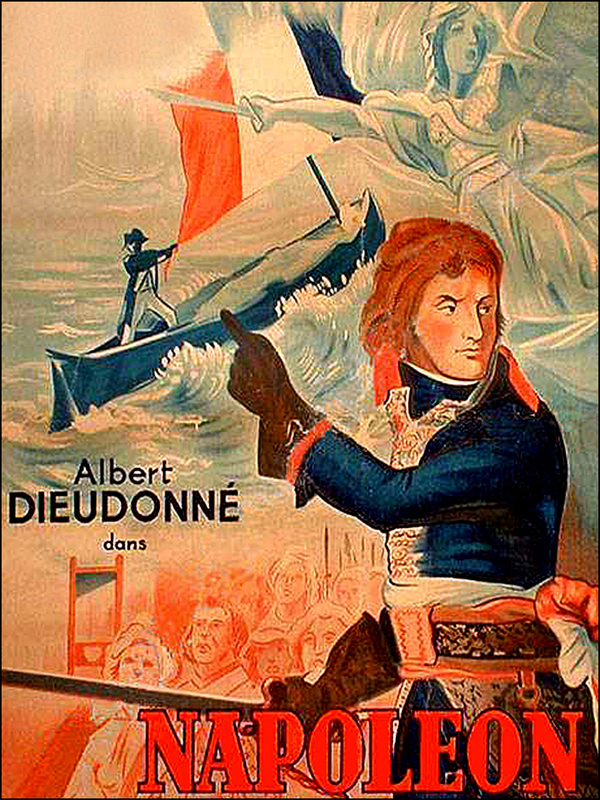 Founded in 1928 (hence the name), it immediately carved a niche in history as the world’s first avant-garde art theater when it showed films by Abel Gance in “Polyvision,” a technique involving three synchronized projectors to show the first wide-screen movies. Fast Forward: Two years later, Studio 28’s fame was secured when Salvador Dali and Luis Buñuel premiered one of the first surrealist films there: “L’Age d’Or” (The Golden Age). Anaïs Nin and Henry Miller went to see it, and afterwards Miller praised it as “pure cinema and nothing but cinema.” But an angry mob was apparently somewhat less impressed—upset by its sacrilegious symbolism, they attacked the theater, threw ink on the screen and destroyed an art display in the lobby that included works by Salvador Dali, Man Ray, Yves Tanguy, Joan Miró and Max Ernst (who starred in the film). After that, programming took a lighter approach when it introduced France to comedies by Ernest Lubitsch, the Marx Brothers, W.C. Fields, and Frank Capra. Today, Studio 28 provides a delightful experience while remaining relatively inexpensive compared to other Paris movie theaters. 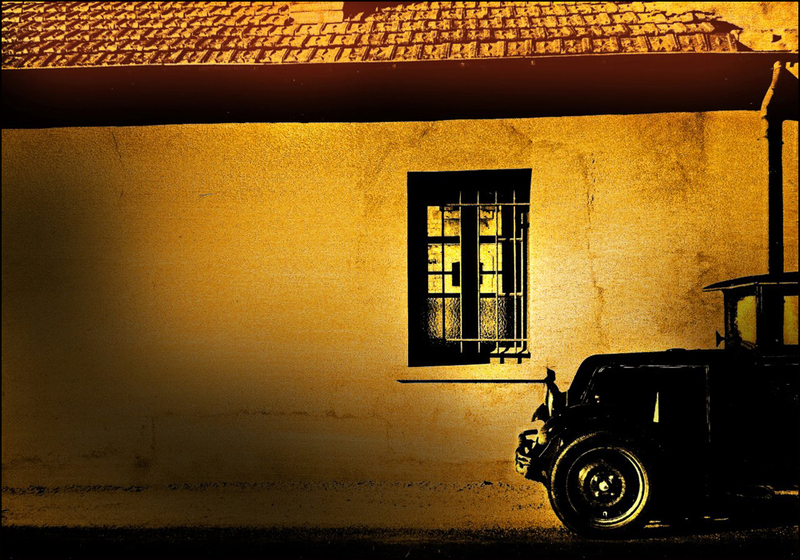 During July, it offers a special reduced-fare series featuring international classics along the lines of “Rebel Without a Cause”, “East of Eden”, “Roman Holiday”, and “Double Indemnity”, among others. 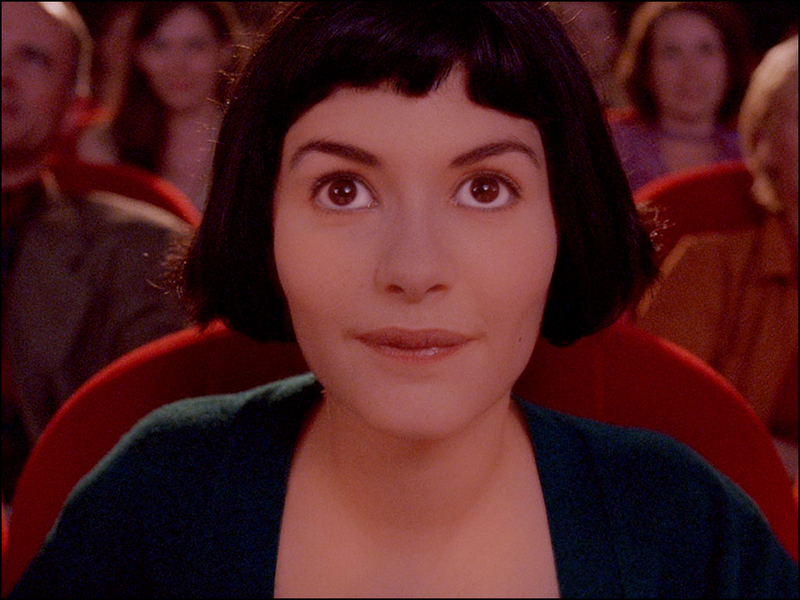 The cinema offers a rare opportunity to experience films the way they were before the multiplex—it’s no wonder that Audrey Tautou’s “Amélie Poulain” headed to Studio 28 every Friday. 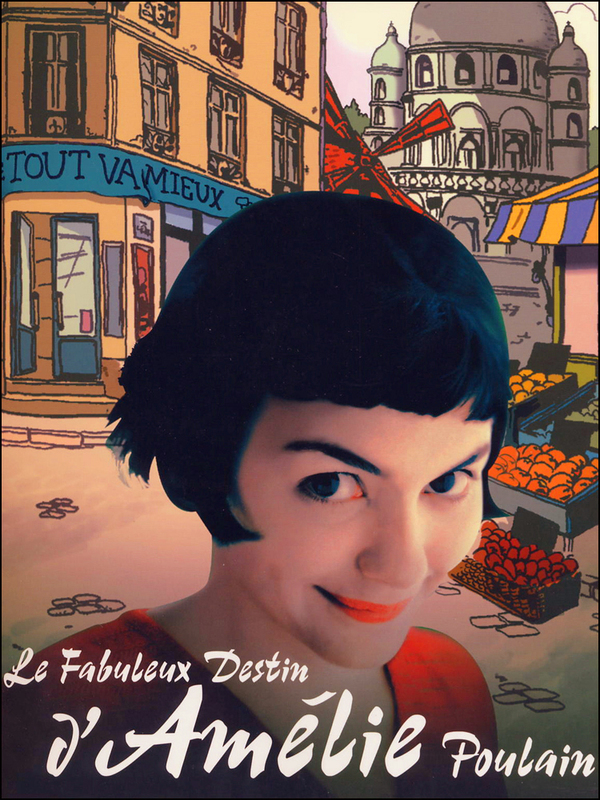 Audrey Tautou’s “Amélie Poulain” headed to Studio 28 every Fridayhad no trouble finding it! Also to note: Studio 28 maintains a rotating display of artwork, and showcases the hand- and footprints of famous actors and directors who have premiered films there. Sweet Spot: A bar at the end of the lobby opens onto a small beer garden (enclosed in winter) where you can sit and have a drink or some snacks before the show. Once you’ve entered the auditorium, settle into your plush red seat, let your eyes adjust to the dark, and make sure you check out the old piano nearby. It last saw serious use when Charlie Chaplin showed his movies here. The large set of surrealist light fixtures in the same auditorium were created by artist and film director Jean Cocteau. Monsieur Cocteau called Studio 28 “a cinema of masterpieces and a masterpiece of a cinema.” I think you’ll agree. Please note: Cinema Studio 28 is closed during the month of August. La Pagode (57 rue de Babylone, 7th arrondissement), looks like a Japanese temple. It was built for the wife of the founder of Au Bon Marché, the oldest department store in the city. Le Balzac (just off the Champs-Elysées at 1 rue Balzac) will make you feel like you’re on a steamship bound for a distant land, thanks to its porthole-and-riveted-steel-hatchways ocean liner decor. At La Péniche Cinéma that particular aesthetic is carried even further, as the theater actually is a ship—well, a barge, anyway—docked at Parc de la Villette each winter, and then moored at La Villette canal basin all summer. Le Grand Rex is by far the city’s largest and flashiest theater. Located at 1 boulevard Poissonnière (between Metros Grands Boulevards and Bonne Nouvelle), this humongous movie palace was erected in 1932 at the height of the Art Deco movement. It can seat audiences of 5,000. Pinching from Henry Valentine Miller YET again: “Develop an interest in life as you see it; the people, things, literature, music—the world is so rich, simply throbbing with rich treasures, beautiful souls and interesting people. Forget yourself.” Carpe diem! Grab my hand. Let’s take a spin around Montmartre with Maurice Sapiro. 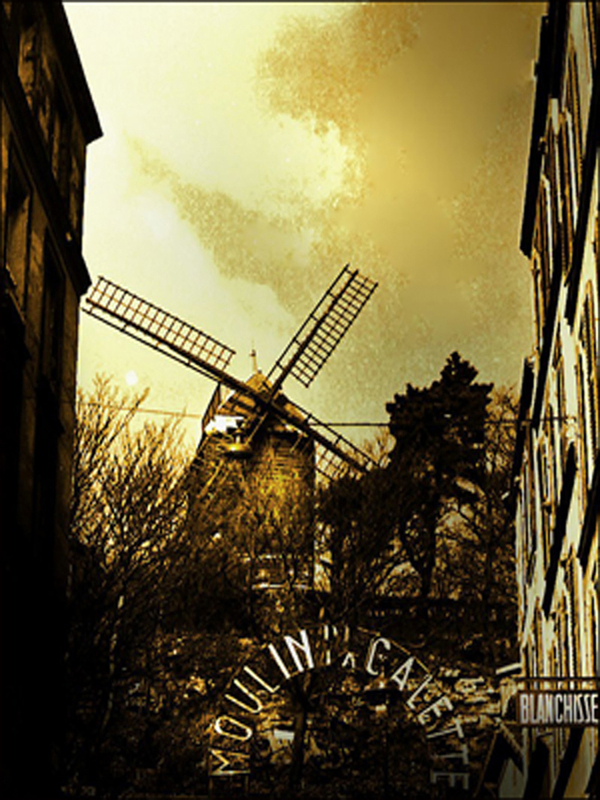 Moulin de la Galette by Maurice Sapiro, Paris, 1956 (View from Studio 28 at the top of rue Tholozé, often painted by Vincent van Gogh (who lived just around the corner from Studio 28 at 54 rue Lepic), one of the last two windmills in Paris. Thank you for the cinema guide in Paris. Ah wonderful as ever Theodora! Thanks for transporting us to another time and place yet again. We can’t get enough of Maurice Sapiro’s photos either. Don’t you just LOVE Theodora’s posts? H, Thanks, Elizabeth! Working with Maurice was a complete joy. Have you seen the film Amélie? It’s worth a viewing or two. For the love of charm, whenever I’m blue, I throw on the player. Plus, it has a great soundtrack. Perfect background music for writing, I do believe. Your words made my week! T.
I adore that movie and your blog. Oddly enough, after savoring your post I was compelled by some mysterious force to buy Amélie ! Blu ray and it arrived today! Popcorn and a movie tonight! Thanks again! Popcorn. Amélie! Perfection. Let me know what you think about movie and the bike! T.
Theadora, Thank you for the beautiful presentation of my photos. They are souvenirs from a wonderful time in my life. Yes,, we’ll always have Paris. I love stepping into your Paris, T. The next best thing to visiting in person. Stunning. Absolutely lóve this post. Reblogged this on Maurice Sapiro. A fantastic post. Mr. Sapiro’s images are beautiful and evocative. 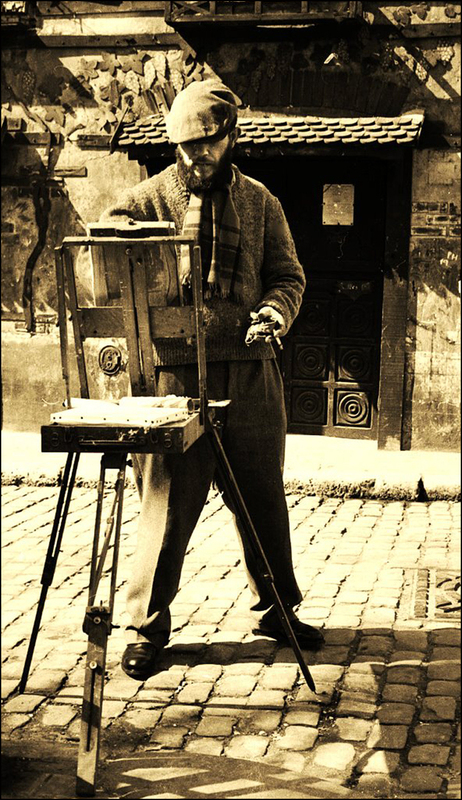 I want to step back in time to 1956 Montmartre….. I visited Montmarte during my first trip to Europe last spring and loved it so much. I’m dying to go back to Paris, and, specifically, Montmartre. So many cities, so little time……. 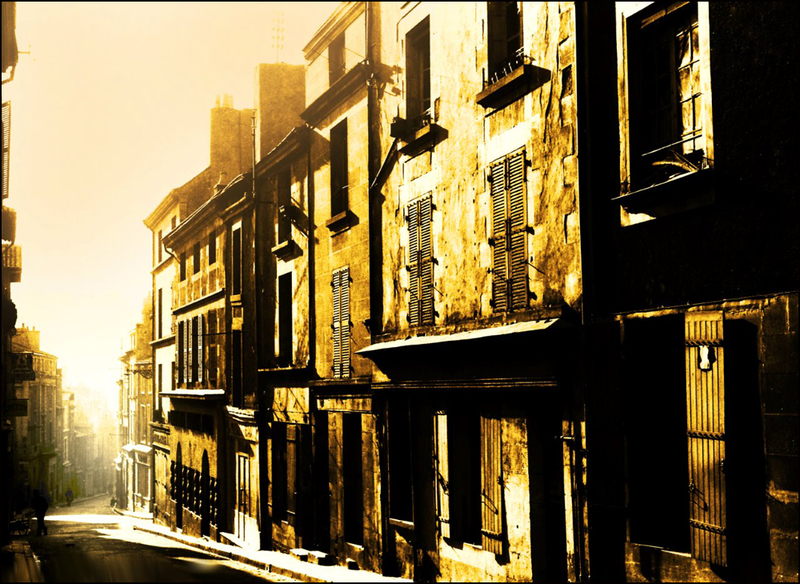 Maurice’s images are the best I’ve seen of Paris. Thank you for sharing them! Thanks, so much, Theadora. I’m flattered that you asked. I’d barely started Sunearthsky when I visited Europe last spring. I started the blog to be about mobile photography, and while on holiday, I shot the entire trip (1,500 images) with my Android phone. I think you saw and “liked” (thank you!) all the Paris images that I posted. I’ve got lots more…..maybe I’ll do a post soon. I guess just feel a bit odd since I was a beginner then and I’m no longer really posting mobile photography….but maybe I should! This is a GOOD post. I adore old movie Theaters. The Club Charles is indeed still there. Are you referring to the Boulevard Theater in Waverly? The building is still there but it’s a drug store, I think. The Boulevard is where I saw “The Planet of the Apes” as a little boy. The Parkway theater on North Avenue has been purchased by MICA(or is it Johns Hopkins?) anyway, Thomas Dolby is moving to Baltimore to do professor stuff and I think they are going to refurbish the Parkway and make it his classroom! Oh, dear. I will send my dad a follow-up message. I’ll report back. Well, that’s great news about the Club Charles and Thomas Dolby. Very interesting! I have two more Baltimore-related questions for you. Do you plan to go to the American Visionary Art Museum’s Kinetic Sculpture Race? And do you remember the little movie theater in Fells Point? I can’t recall name. I saw a slew of Godard films there. Thanks! T.
I’ve never attended the kinetic sculpture race, which is weird, because I have friends that have been in it. I believe that you are referring to the Orpheum. Agreed, I fall in love with Paris again with every sojourn you take us on! Thank you. I wanna start watching foreign films and that’s a cool guide!!!! I have never seen it, but it sounds lovely. I will definitely check it out next week. Thank you Theadora for such a thorough recommendation and you probably heard this before but you’re blog is AWESOME!!! Hmmm, for some reason I didn’t get email notification of your latest wonderful post. Maybe the WordPress gremlins are acting up again. And thanks for more of the fabulous photos. I love them all buy my favorite is the first one. I found out after I posted that, that for the last four days or so, all my WP notifications had been going into spam. Gmail gremlins, I guess, because I certainly didn’t change anything. Thankfully, I have a techie husband and he finally figured out what I had to do to get things back on track, although it doesn’t at all explain why the sudden change. And there were other things going into spam as well. As for changes, seems like everywhere just changes periodically but may or may not let you know what they did. Very frustrating!! Off to take a walk, although it’s cloudy and chilly. Invaluable, in-depth and full of va-va-voom! Your posts are always totally fabulous Theadora. I just loved the thought of Anais Nin and Henry Miller in Studio 28. And now I want a windmill at the end of my road! 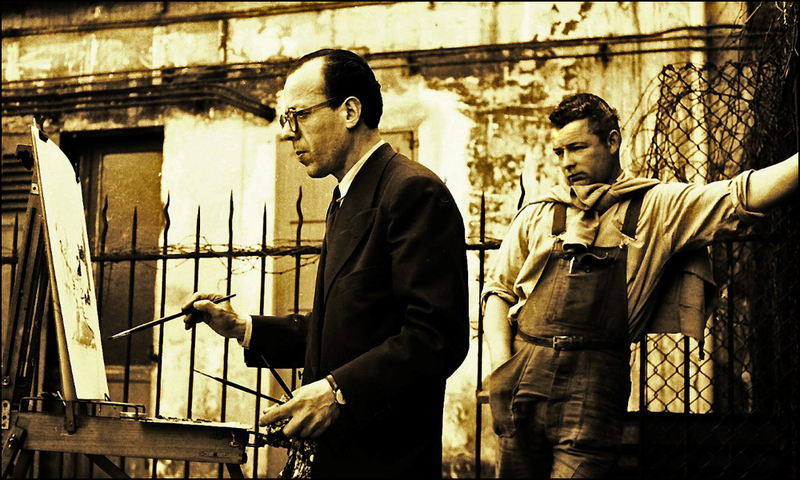 Those photos by Maurice Sapiro are just incredible…..I feel I am actually there, in Paris in 1956. Love it, love it, love it! Thank you, Karen. Oh, to have been in the Capuchin Crypts for the Phatasmagoria!!! Yikes and goosebumps, what delights. Sapiro’s photographs are too marvelous. I must find L’Age d Or ….. and see what all the fuss is about! Lovely and delightful post, dearest Theadora……just lovely. Dear Tin Man, Virginia has the original ruby shoes! For the love of glitter, mana, Judy, provenance, and Cendrillon, thank goodness! T.
I love this latest post. So many memories of the times *I* was in Paris, with my own dear Sweetie. Thanks for bringing them back, again and again. Ah, Martino, I love your words. You’ll have to return with your sweetie again and again! T.
Ah, Merci. YES. Studio 28, Studio des Ursulines (opened as a movie theater in 1926), and MK2 Studio Parnasse (1930) joined the Association Francaise des Cinémas d’Art et d’Essai early in 1955, according to my research. An important organization! All three theaters are still open. Thank goodness. Do you have a favorite French director? Eric Rohmer is a favorite. He is missed. T.
Love your wonderful tour. 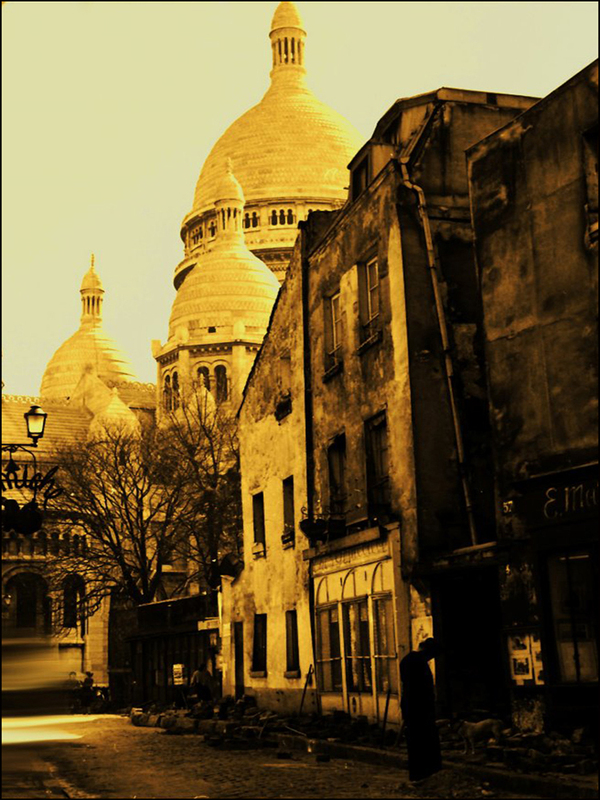 My brother-in-law lived in Montmartre during the 70’s and 80’s, was a wonderful experience visiting this special place. 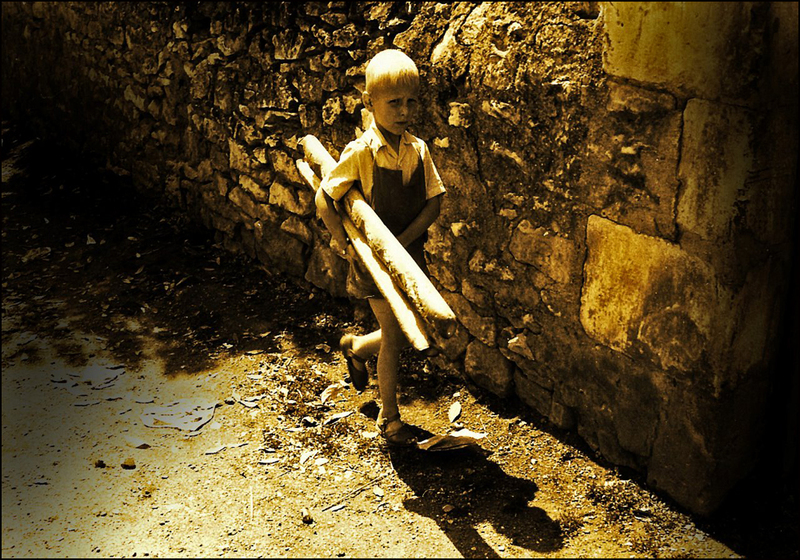 Fabulous photographs Maurice, especially the little one with his baguettes. Mary, thanks for joining me on this trip down memory lane. Theadora brought back wonderful memories. Thanks Mary, thanks Theadora! Love your story Theadora, carrying the model must have been some scene – how funny, but oh so determined and what a find for you! Happy to meet you and looking forward to many more of your posts. Hope you have a wonderful weekend. If I could only get a photo of you carrying the model, I could retire. Wonderful post! I’ve only been to France once and long to go again. “How could Monet live here and not paint?” Yes! So much inspiration. On January 23rd posted a watercolor I did from a photo of a gardener from Monet’s garden that I took. Love your blog! Thanks! What a great trip! Did you make it to Marie Antoinette’s little opera house at Versailles? With its seats for only forty, its walls and ceilings of blue velvet and paper-mâché ornaments mimicking putti, shiny gold, and cool marble, I felt her presence there. Do you have a link to your January 23rd watercolor? Please share! This is the link to my painting. Hope you like it. I’m so glad you shared your water color of the gardener, lost in thought. The piece is so dreamy. And so it knock-out frame, by the way. Regal-looking. They dance well together. I think you’ll enjoy the NPR piece about the volunteer gardener. She gave her dream job in California, moved to France, an volunteered at the garden for one year. Enjoy the rest of the week! T.
No home cinema can compete with these magical places ! Thank you for this “fabuleux” tour ! Merci! Thanks to your post about Francis Picabia, I’m now tracking down René Clair’s “Entr’acte” film. 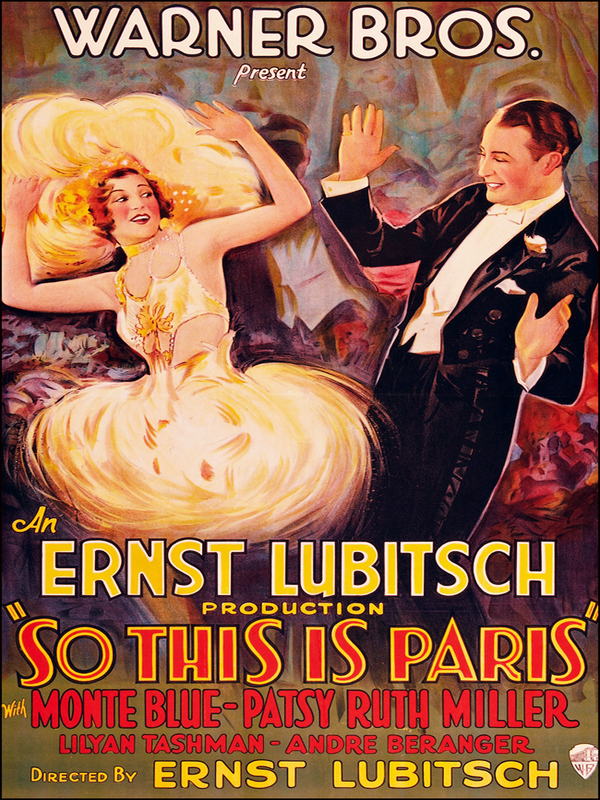 It opened at the Théâtre des Champs-Élysées. I saw a brief clip of it years ago at a Dada exhibition. Along with our favorite dandy (Francis Picabia), Erik Satie, Man Ray, and Marcel Duchamp have cameos in the flick. Satie composed the music. Thanks for the inspiration! T.
You’re so welcome ! I’m thrilled to have inspired you ! Wonderful writing and wonderful photos. What a presentation you have! She smiled as she slipped on the ruby slippers. ” And they thought they had the right ones. The askew bow should have given it away. Her’s were the originals. Only to be worn on special occasions. ” Tonight she was meeting Tinny at Studio 28. To see King’s Delta of Venus. ” I’ll go early”, she thought. “Tinny likes a glass of bubbly” before a movie. Putting Nin’s book back on the shelf she slipped into the night and Montmartre. I was not that far ahead of you and heard your footsteps on the cobblestones, oh wonderful I thought, Virginia is early, we can have some bubbly before the the movie. Hope Theadora is already here, we shall have a grand evening of it! I’m here! I’m running the concession stand. It’s time to pop more corn! T.
So you have the original ruby slippers? Ah, yes, I knew it! Enjoying an evening with the Tin Man is always, always a special occasion. And speaking of Anaïs, I’ve always enjoyed one of the last letters Anaïs wrote to Henry in October 1955. I found it in my copy of “A Literate Passion: Letters of Anaïs Nin & Henry Miller 1932-1955. Here’s a lovely snippet from it: “I had to re-pen Diaries and the Henry who emerged from them is wonderful and it truly is so alive and permanent a portrait that it blotted out the dark last part of the relationship, its disintegration etc. The causes are so clear, too, that if we had seen them then they could have been remedied. Oh so wonderful to be privy to such intensely personal thoughts – words written then could apply to much that happens to some of us. It is interesting how we sometimes only remember the good parts of the relationship, and think how it could have been. Yes. Self-protection, I guess. I’m now humming Alan Bergman and Marilyn Bergman’s “The Way We Were” tune. T.
It’s difficult to imagine people nowadays getting so irate about sacrilegious films that they would stage a mini-riot. They obviously missed the humour! Thanks for reminding me of Roman Holiday – I shall watch that tomorrow! Great post, T! Love the Sapiros. Theadora, how right you are .Richard’s photos are a knock-out! I love the Guests! Thank you Richard, And of course, thank you Theadora.. I thought so, Maurice. He’ll love your words! T.
ooooo la la I saw Amelie not too long ago and it was great fun! Café des Deux Moulins, 15 rue Lepic at rue Cauchois. D’accord, Theadora, I am now officially a Maurice Sapiro groupie! (About the right age too!) Thank you for another fabulous post! Theadora, Please don’t tell Patricia I’m 81, I need all the groupies I can get. Who knew that the history could be as entertaining as the entertainment?! I had a suspicion that the world of ‘Les Triplettes de Belleville’ was real, you have confirmed it! 🙂 Thanks so much for yet another beautiful escape T! Well, thank you for the kind, kind words! I’m also a big time fan of Sylvain Chomet’s Les Triplettes de Belleville! Say, do you have a pet movie house in the world? Years ago, I got to see the Notting Hill film in Notting Hill at the historic Coronet Cinema. It wasn’t planned. I was visiting London with my sister. We had just landed, and decided to take a little stroll to beat the jet lag blues. And then, bang! A thunderstorm approached. What to do? What to do? “Let’s see a movie,” my sister said as we passed the Coronet. Wise sister! The Coronet makes a few cameos in the movie. Perfection. Hugh Grant and red velvet seats! Laughing, I’m impressed, you looked at the link! I got some curious comments regarding the name of this theatre, as you can imagine?! Merci, Thom! Thanks for spreading the word. I really appreciate it! T.
Theadora, Probably know by now that I re blogged this one. I enjoyed visiting via the net. My what we have given away(In NYC)… thee are very few “unique” theaters left. The Angelicka, the Sunshine,, the film forum, and for big screen – the Zeigfield are a few of the “old ones” but they have really lost some of there charm. But they at least show great films. As a cinéphile / film buff, I find Paris one of the best cities for movies! London has its theaters and New York has its clubs but Paris has the best cinemas in the world. 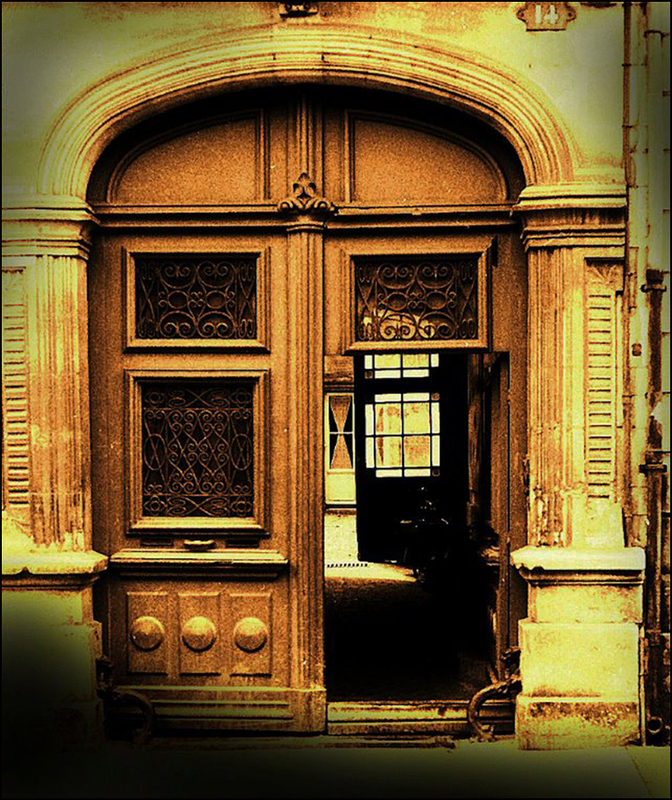 In fact, my last Where Is It Wednesday featured a recently polished jewel of the 7éme art: Lu Louxor, near Barbés. Thanks for the trip down memory lane, my friend! Perfect timing, Paul! Oh, Lu Luxor is such a beauty, Paul! Built in 1921, it’s still a stunner. Thank goodness it was rescued. People love going to movie houses in Paris. The number of screens in the city keeps rising. According to the Economist, next year the count will hover around 431. So many choices! Years ago, I remember seeing Sam Peckinpah’s “Pat Garrett and Billy the Kid” on Christmas Day. And the movie house was packed! T.
Una Impresionante Serie, Algunas De Ellas Son Realmente Hermosas… Un Saludo. Wow, your posts are so informative and evocative- love the photos too. Six weeks to go now before we return to Paris – your posts are keeping the dream alive for me! Tick! Tick! Tick! I’d add a movie theater to your list. Studio 28 is located in the heart of Abbesses. There’s plenty to do before and after the movie: bars, cafés, museums, and shops. Also, Sacré Couer is about a ten-minute walk from the cinema. The perfect spot to look down on the city and the Eiffel Tower as the sun sets. For a drink, I recommend Café Saint Jean (located near the Métro Saint Jean). It’s affordable. I love their salad with chicken. It’s another great place to people-watch. Ask for a seat outdoors on the terrace! T.
Wonderful Theadora, and the photographs by Maurice Sapiro are amazing! 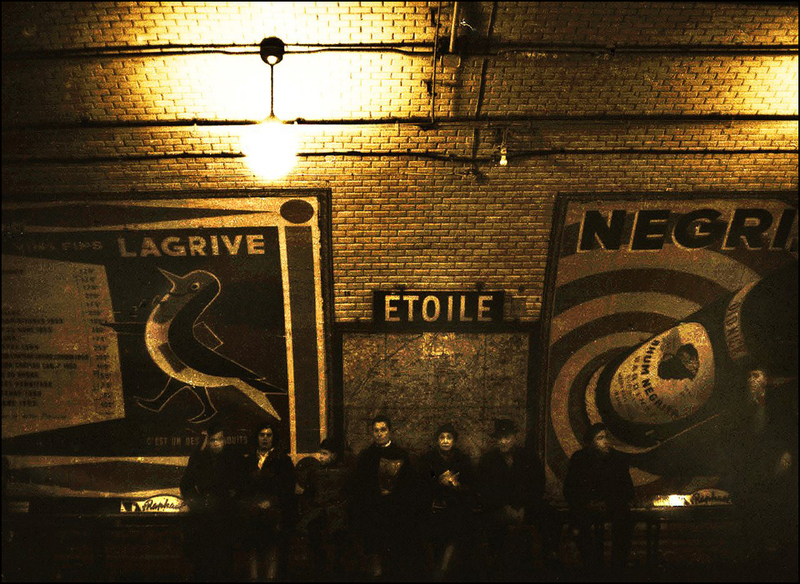 Love, love the golden photos– of course, the boys with the baguettes– and also the elegant doorway. I always get the travel bug when I come to your blog. thanks! Lovely, as usual! Thought I’d let you know I’m going to be in Paris for a long layover April 13-14. Any suggestions of things to do?? Two days in Paris? Exciting! Are you looking for indoor or outdoor activities? Food joints? On Sunday, I’d definitely spend the morning at Porte de Vanves Flea Market. I’ll now check-out the Paris brocante listing. There’s a “Henri Cartier-Bresson” exhibition at the Pompidou Centre (through June 9th 2014). I’ll return this evening with a few more recommendations. Stay Tuned! T.
More great shots from Maurice Sapiro. I have Amelie on DVD, but never gotten round to watching! But I have a lot of movies to catch up on and not enough time! Thanks! YES. Make time for Amélie! 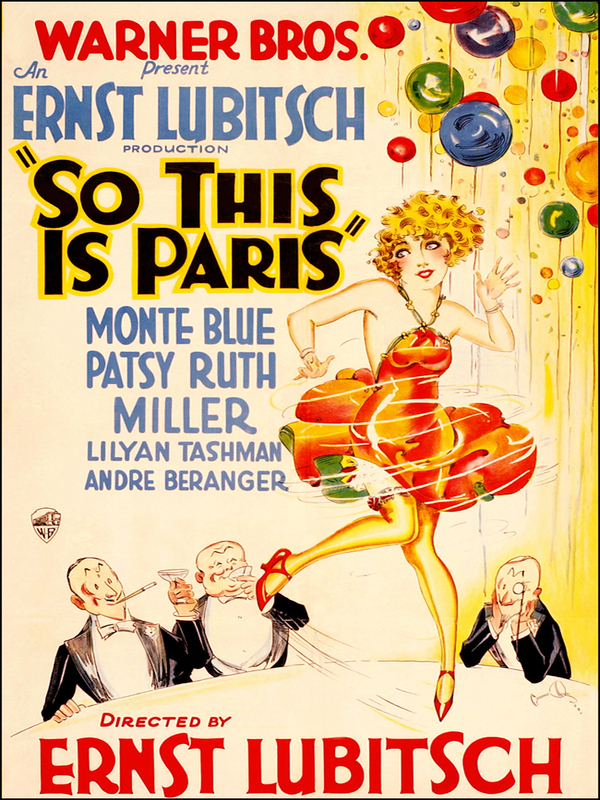 It was shot in Abbesses-Montmartre. And Goodness. Gracious. I just spied your mouth-watering, voluptuous Fromage series. Thanks to your eye, even in black and white, cheese tempts! Shapely. Gorgeous. T.
Thanks! Cheese always looks good! Especially French cheese. A belated happy birthday! Thank you for making me feel with every post like I’m there with you! Wonderful writing and research. Amelie is, hands down, one of my all time faves! Grabbing your hand Theadora for some fabulous lights, crepes, action! OMG, Theadora! You really do know EVERYTHING about Paris! Loved the delightful lesson, and was amazed by those photos by Maurice Sapiro. Never heard of him — but he was sensational! AH, MERCI. 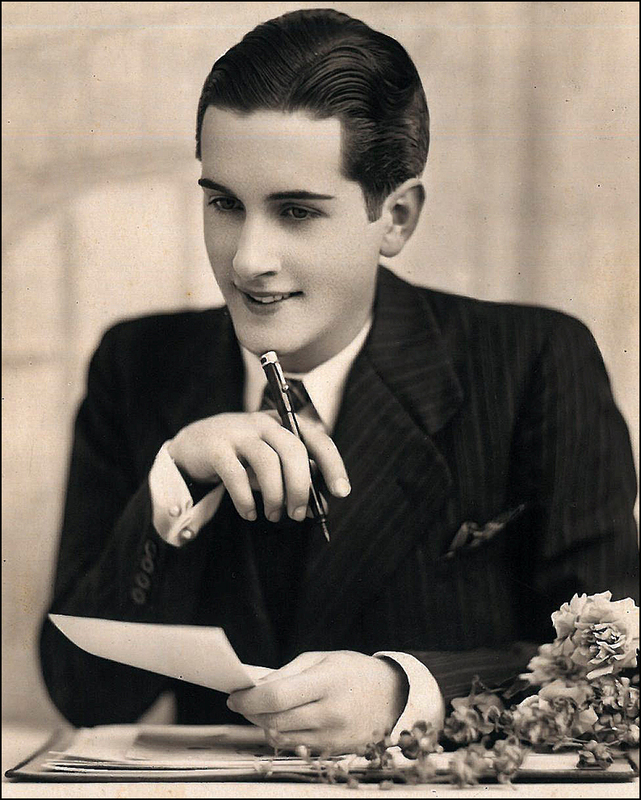 Maurice will also appreciate your sweet words. By the way, he is still sensational. Later on this summer, we plan to share more of his fabulous Paris shots. Thanks to Theadora, soon I’ll be a household name..